With Malice Toward None --------- by Lee Harris: Who's It? "I think we as a party need to begin our transition from an effective opposition party, which we needed to be because health care and cap and trade were horrible ideas that would bankrupt our country, and move toward becoming the alternative party, the adult party, the party of real ideas that turn our economic and fiscal situation around." That's kinda funny. First, Representative Ryan said that health care and cap and trade are horrible ideas that would bankrupt our country. It may be true that the cost of those "worthy ideas" may be extremely expensive, but the usual procedure is to make some cuts somewhere and/or levy taxes or fees to pay for the government expense. Those concerns were addressed in the legislation. But, you must also remember that George W. Bush already bankrupted the country with a tax cut for the rich that wasn't balanced with a reduction in expenditures. President Bush then grew the Federal Government without paying for it. The Iraq War and the prescription drug benefit that was added to Medicare were not funded -- they weren't put in the budget......At least it now seems that the adults in the room understand how ALL items in the Federal Budget have to be paid for with tax monies, fees, etc. Second, it seems to me that a winning strategy employed by the Democratic Party in 2006 and 2008 was to paint themselves as the party with ideas and the party of fiscal responsibility. As the presidential election neared and the country found itself floundering in a sea of debts and obligations many voters decided that a Republican had screwed it up and maybe a Democratic president could do something about it. Candidate Obama enumerated many ideas, perhaps, too many. And, even now, as the blame game continues about health care, jobs, and the budget, it seems only the Democratic members of Congress have actual ideas written down. They don't have some lame road map or vague plan that just says we're going somewhere without any -- any -- specific ideas/programs/rules that add to the debate. In fact, when pressed for what things they wanted in the health care bill, we find that it had already been included in the proposed legislation. Read the bills before you attack them. Even if Republicans don't want to admit the mistakes made in the last Administration is still seems rather hypocritical and/or ironic that most of the Republican rhetoric heard today are echoes of the Democratic grousing during the Bush presidency. You know, all except for the insane socialist labels and the Hitler/Nazi bullpucky. Actually, both political parties and the fringers need to raise the level of discourse. We need a return to civility. We need a return to a real "back and forth" about the issues that are important to the American people, not the corporations. When we were in our government classes back in high school the teachers always had round-table discussions and/or debates about things. We learned how to listen to one another and we learned how to put together coherent and logical arguments. As a "side" on some topic would be assigned by the luck of the draw, we often found ourselves arguing for something we didn't believe in -- it was a valuable learning experience. Today, it seems as if the Republican Party simply refuses to even debate the issues. They do not bring to the table their opposing viewpoints with documents, experts, or anything else to help bolster their arguments. 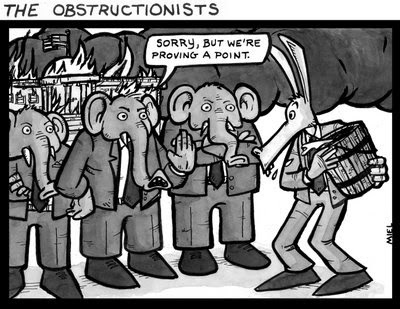 Imagine if you played "Republican Obstructionist" in Mr. Cy Smith's PHNHS Problems of Democracy class. You would disrupt the lesson for everybody, cause the exercise to be worthless for yourself, and receive a failing grade. All the other folks in class would think that you're nuts. We're not in school. And, the Republican shouldn't be standing next to the sandbox flinging sand while the rest of the elected try to build something. Help or get out of the way. Govern or go find a corner and pout. In Michigan, the political climate is as combative as it is in Washington, D.C. Governor Granholm's legacy will be that she presided over the sinking of the Ship of State while the Republicans rearranged the deck chairs and the Democrats happily joined in with the fun. Both parties have brought the State of Michigan to the brink. Both parties regard the act of compromise as losing power for themselves and their party. No one wins.............everybody loses. Even when Governor Granholm presents the Republicans with tax relief plans that they always supported in the past, they now reject them. Stop asking when a bill is brought forward if voting one way or the other will hurt you in your reelection campaign. The question should be, "Will this help the people in the State of Michigan". Dear Legislator, you were elected to serve the people of your district and the rest of Michigan. Please stop worrying about your political future while our prosperity, health, and welfare suffers.